I wasn’t going to read this although it was for a group (4_Mystery_Addicts) and available in Audio format. 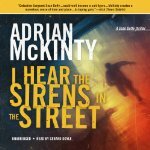 Then I found out from the early discussion that McKinty’s second novel in the “Troubles” trilogy takes place during The Troubles of Northern Ireland – (1968- 1970s). That got me curious and the sample sounded good. About chapter 10 I got a tad annoyed – a goodly chunk of the plot is the same wolf in sheep’s (er – pig’s clothing). Whatever – the cops and politicos are corrupt, yawn. (Is this supposed to be shocking or does it simply resonate with most readers as realism? Maybe the “who done it” part just doesn’t matter any more.) But there are other suspects so that eases up my annoyance level a lot. The interesting parts kept me going though – the forensics, the historical background (which is underscored in several ways) and the character was kind of fun although he’s another “as usual” in crime books these days – to wit – lead detective, Sean Duffy, is unmarried, a rather soft-spoken loner, enjoys music, but a bit of a rogue. Another element to keep me reading with interest is the very nice writing and the humor – (lots of great understated humor) is good stuff.